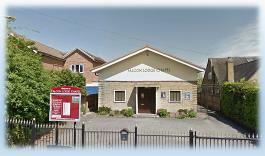 Falcon Lodge Chapel (known locally as ‘The Chapel’) is an independent free evangelical Christian Fellowship located one mile north east of Sutton Coldfield town centre on the edge of Falcon Lodge housing estate. We have occupied our present site since 1954, and in 2019 are celebrating 65 years of serving our community and sharing the Good News of Jesus. Through those years thousands of people have enjoyed different groups and activities for all ages, and countless lives have been changed through a personal experience of Jesus Christ as Lord and Saviour. We have a big reputation for offering a warm and friendly welcome to visitors. And we’re certainly not a ‘Sundays only’ church. There are meetings, events and activities taking place throughout the week, on our premises and elsewhere. There’s loads of information and helpful links in our website, but if you have a particular question or want to contact us, use the red button (as shown below) found on each page which will direct your email to the person in our church best able to help you about that specific group or topic. Alternatively you can try the ‘Topical Search’ tab.